The Lost World: Jurassic Park is a 1997 American science fiction adventure film and the second installment in the Jurassic Park film series. 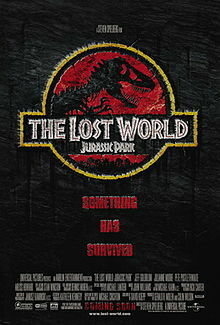 A sequel to 1993’s Jurassic Park, the film was directed by Steven Spielberg and written by David Koepp, loosely based on Michael Crichton’s 1995 novel The Lost World. The film was produced by Gerald R. Molen and Colin Wilson. Actor Jeff Goldblum returns as the chaos-theorist and eccentric mathematician Ian Malcolm, leading a cast that includes Julianne Moore, Pete Postlethwaite, Vince Vaughn, Vanessa Lee Chester, and Arliss Howard. Goldblum is the only actor from the previous film to return with a major role. Cameos feature return appearances by Richard Attenborough as John Hammond and a brief appearance by Joseph Mazzello and Ariana Richards as Hammond’s grandchildren Tim and Lex. The story is set four years after the events of the original film and centers on the fictional Central American island of Isla Sorna, off the Pacific coast of Costa Rica, where the cloned dinosaurs made by John Hammond’s InGen have been roaming free in their own ecosystem. Learning that his nephew, who took control of InGen, is planning to capture the Isla Sorna dinosaurs and bring them to the mainland, Hammond sends an expedition led by Dr. Ian Malcolm to arrive there before InGen’s squad. The two groups confront each other in the face of extreme danger and then team up in order to survive.